Our customers comprise of many renowned manufacturers and operating companies. The many years of on-going co-operation with these companies, signifies recognition and confirmation of our work. 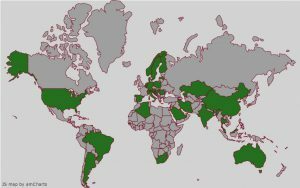 Green marked parts of the map above show you, for which countries we already have been doing projects. Would you like to have our company and its services presented in more detail? At your wish, we would gladly organize a personal meeting. Please call us for an appointment. Details of our references are available upon request.